River Thames RiverRichmond upon Thames boasts 21 miles of riverside and is the only London borough to span both banks of the Thames. The riverside in Richmond town is particularly picturesque, even more so on sunny days, when it attracts countless visitors who bask in the sun on the grassy landscaped banks. Strolling along the Thames Path is one of the great joys of London life, following its tranquil scenic route to a favourite waterside pub, taking a circular walk via one of its many bridges or dipping into its impressive catalogue of attractions. No other capital city in Europe offers so much to enjoy, both indoors and out. Kings, cardinals and commoners who created the attractions here wanted the biggest or the best, and knew how to get it. Their legacy includes Hampton Court Palace, built by Cardinal Wolsey in such extravagant style that Henry VIII took it for himself; Marble Hill House, the gilded showcase created for George II's mistress, Henrietta Howard; The National Archive, a dry name for a compelling assortment of national treasures such as Guy Fawkes' Confession or Shakespeare's Will; the Kew Bridge Steam Museum which used one of the biggest steam engines in the world to pump water from the Thames - or Fullers and Youngs, London's oldest breweries which still draw on the river to make their beer. 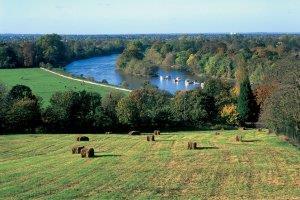 Richmond upon Thames boasts 21 miles of riverside and is the only London borough to span both banks of the Thames. The riverside in Richmond town is particularly picturesque, even more so on sunny days, when it attracts countless visitors who bask in the sun on the grassy landscaped banks. London's rural Thames is easily reached by public transport. Trains: There are regular trains from London Waterloo and Clapham Junction and from the West via the Reading to Richmond service. There are many stations just a short walking distance from the river. There are also river boat services that operate here. Underground: District line to Richmond Station.